Hose down your tires and they look better than ever, blacker than night itself. Unfortunately, that look lasts maybe 20 minutes. At Surf City Garage, we wanted to make it last for weeks. That’s why we created Surf City Garage Beyond Black Tire Pro, the ultimate tire dressing. It’s never greasy and dirt won’t stick, plus it even protects against UV rays. Just apply it and buff, and your tires will look wetter than wet and blacker than black. So when it’s time to dress up your car, don’t accept a second-rate look for your first-rate tires. Give them the sheen that is Beyond Black. Directions: (1) Shake before use. For best results, clean tire first with Beyond Steel. (2) Place product on clean cloth or applicator and apply directly to tire. (3) Allow to dry before driving car. Warning: Do not use on motorcycle tires, seating surfaces, pedals or any surfaces that would be hazardous if slippery. 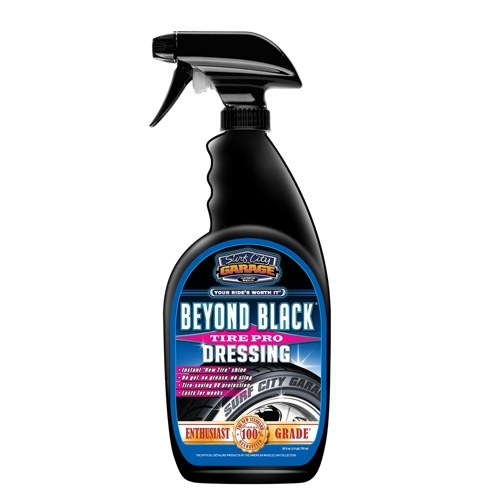 Mothers Back-to-Black Tire Shine - 24 oz.